BALTIMORE — It's Tuesday at Calvin M. Rodwell Elementary School in Northwest Baltimore and that means a select group of third graders get to put on their lab goggles and learn something new in the world of science. 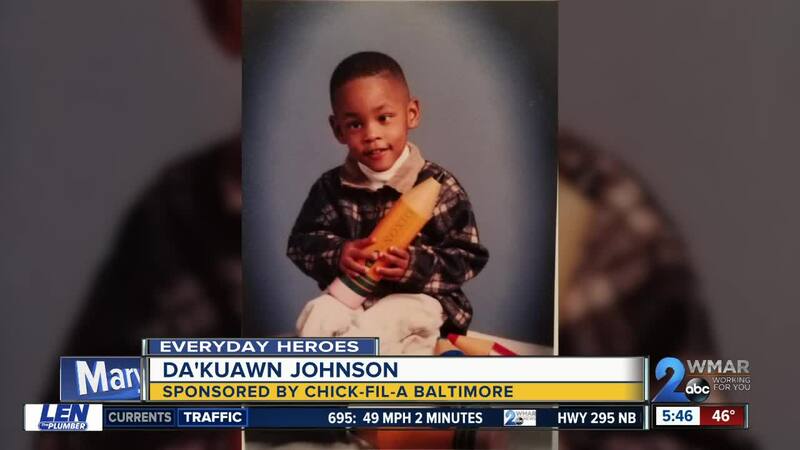 Leading the day's experiment is Da'Kuawn Johnson, a 24-year-old student at the University of Maryland School of Medicine. He is one of dozens of medical students who volunteer with the Talent Mentoring Program. "I enjoy seeing that spark, seeing that energy and really bringing to life what science is," he said. The Talent Mentoring Program is a partnership between the UMD School of Medicine and Baltimore City Public Schools where about 50 medical students go to different schools once a week to mentor students who are considered gifted and talented. Johnson is mentoring students at the very same elementary school he attended as a child. He credits his third grade teacher for going the extra mile to encourage him to explore science and math. "Once I started getting that positive reinforcement from my teacher, it really changed the game," he said. "It made me think about instead of becoming a chef or a basketball player or something else outside of academics, maybe I'll be a mathematician, maybe I'll do math for living. This is super fun and I can enjoy it." It's pretty amazing to see where Johnson is today in his life compared to how he came into the world. He was born eight weeks premature, deaf and partially blind. Around the age of one, he was diagnosed with lead poisoning, which caused learning disabilities. "While they weren't wrong that I don't learn like my classmates, I don't see it as a deficit. I think it just gives me a different way of viewing the world and approaching my work," he said. Over time, Johnson's health greatly improved and he excelled in the classroom, particularly in math and science. He graduated from Baltimore Polytechnic Institute, went to University of Maryland Baltimore County for his undergraduate degree, then got accepted into the University of Maryland School of Medicine. Johnson is doing a dual medical/PhD program and wants to become an endocrinologist with a research focus on immunology. He is a big advocate of promoting diversity in STEM fields and is active with his school's Diversity Advisory Council. He's also very dedicated to mentoring students and not just the third graders at Calvin Rodwell. He also works with middle and high school students. Teachers and school officials with Baltimore City say the students are able to connect with him on a deeper level because he's been in their shoes. "He's a student who grew up in the same neighborhood, the same experiences that these kids are going through. He understands the struggles, he's very relatable," said Dennis Jutras, the coordinator of Gifted and Advanced Learning for Baltimore City Public Schools. "How he makes them think about the things they can accomplish in their future, I think is just amazing," said Ellyn Boney, a teacher at Calvin Rodwell. Johnson says it would be great if one of his young students wanted to become a doctor or scientist, just like he did, but he tries to look at the bigger picture. "The greater goal is just to make sure that they recognize the potential that they have, they might not become a doctor or a scientist but they can start thinking critically and whatever they do, they're thoughtful and they're conscientious of their actions."